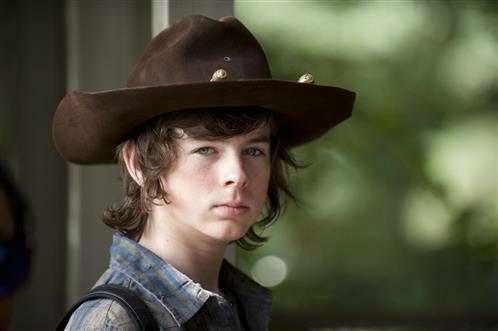 AMC’s The Walking Dead returns tonight with “Claimed”, the eleventh episode of season four. The episode starts with Tara and Glenn in the back of Sgt. Abraham Ford’s truck. Glenn is still unconscious and Tara is seen writing notes on her hand of key areas they have passed. They come across a small roadblock and are forced to stop. Walkers begin to swarm the truck. Abraham jumps out and banters playfully at them before killing them with a crowbar. Tara points out that she’s never seen anyone smiling while killing walkers before. Abraham sarcastically tells her that he’s the luckiest guy in the world and asks her to help him move a car out of the way so they can continue down the road. Carl and Michonne are in the kitchen eating dry cereal. Michonne comments that she misses soy milk. Carl says he had it once and almost vomited, adding that he’d rather have Judith’s formula. The comment seems to remind him of the recent loss they experienced and he becomes withdrawn. Rick thanks Michonne for making Carl laugh, adding that he had almost forgotten the sound. He tells her that he can’t be both his father and his best friend so Carl needs her. Michonne asks him what the “plan” is, if this was a permanent home or if they were just stopping along the way. He tells her that they will stay until they “figure it out”. 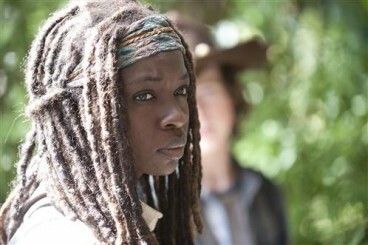 Michonne tells him he needs to rest for one more day, so she and Carl will go on a supply run. After scavenging the first house, Michonne asks Carl if he’s found anything good. He hasn’t. She tells him that she’s found crazy cheese! She sprays a huge glob of it in her mouth and makes walker noises in an attempt to make him laugh. Carl doesn’t respond so she apologizes. She tells him that she’s not good with boys his age but that she had a three year old son whom found her extremely funny. This causes a bombardment of questions from Carl as the two enter a second house. She tells him that she’ll answer one question at a time, one room at a time AFTER they clear it. Rick wakes up from his nap to the sound of voices downstairs. He crawls under the bed to hide as a man with a gun begins searching his room. He tries his best to keep quiet (despite being in pain) as the search concludes and the man plops down on the bed above him; presumably to sleep. The first question Carl asks Michonne is what her son’s name was. We learn that it was Andre Anthony. He begins asking another question but she reminds him of the rules of the game and they move on to clear out the next area. When done, Carl asks if she’s had any other children. She tells Carl that one was enough and that Andre was a handful, much like he is. They end up in a hallway and Carl asks if it counts as a room. “Only if you find something,” she tells him. He finds a painting blocking a door and brings it to her. His final question is how long it’s been (since her son died). She tells him that it happened — after everything happened. He asks if his father knew. She tells him that she’s never told anyone else. Carl tells her that the secret is safe with him. She tells him that it’s not really a secret. “It’s still safe with me,” he replies. The painting is of a woman and it appears to have been scratched over. Finding this alarming, Michonne begins searching the room that the painting was blocking. It’s a child’s room and empty, but there’s a door leading to a second room. Inside, she finds the corpses of four children laying said by side in two twin beds. In a chair by the window is a fifth, larger body with a large hole in the back of her head. It appears that the the mother killed her children before committing suicide. Michonne leaves the room and runs into Carl. He asks if there’s a baby in the room. She tells him that there’s was only a dead dog to spare him from the troubling scene. Carl opens up and tells Michonne that Rick let him name Judith and maybe she and Andre are together somewhere. The episode cuts back to Rick, still trapped under the bed. A second man enters the room and begins arguing with the first over who gets to sleep in the bed. A fight ensues and one of the men is strangled to death, right in front of Rick. The winner climbs into bed, claiming his prize unaware of Rick hiding below. Glenn wakes up in the truck and asks Tara where they are and asks about the bus. Tara says they passed it about three hours ago, but she’s been taking notes so that they can find their way back. She tells him that everyone on the bus was dead. Glenn asks for the truck to stop, but the only response he receives is Abraham flipping him off. Angry, he begins hitting the back window with the stock of his gun until it cracks. Abraham pulls over, allowing Glenn to jump out. He wants to head back to look for Maggie. Abraham tells Glenn that the fate of the human race depends on them. He introduces himself, Rosita and Eugene. He explains that they are on a mission to get Eugene to Washington because he’s a scientist and knows exactly what caused this mess. Glenn asks what happened but Eugene tells him it’s classified. We learn that Eugene has a satellite phone and has been talking to people in Washington with it, but hasn’t heard anything in two weeks. 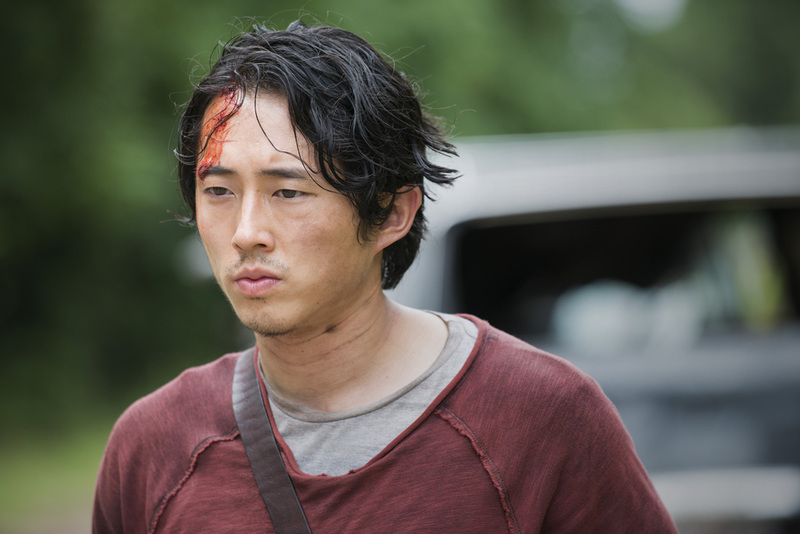 Glenn apologizes but continues walking away. 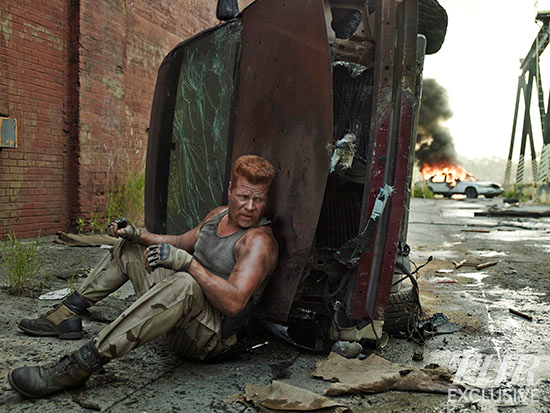 Abraham tells Glenn that he has zero chance at finding Maggie — alive or dead. Angry, Glenn turns and punches Abraham, causing a fight to break out between them. Walkers begin coming out of the field. At first, Eugene is the only one to see them. He grabs a gun and begins shooting them. Unfortunately, his aim is atrocious and bullets seem to be flying in every direction. The others join in and the walkers are put down with heavy fire power. One of Eugene’s bullets pierced the gas tank of the truck causing fuel to spill out all over the ground. Rick quietly crawls out from under the bed as the man above him sleeps. A third man begins to come upstairs, calling for the one sleeping in the bed. As the two men head downstairs, they talk about a woman’s shirt that had been found. It had been recently washed and no one would go through the trouble of cleaning it unless they were planning to return. Rick heads into the bathroom and encounters another man sitting on the toilet (awkward!). They struggle but Rick overpowers the man and strangles him to death. He then takes the mans gun and climbs out the window and onto the roof. He jumps down to the ground and begins to make his way towards the front of the house. We see Abraham under the truck. He talks about a past experience in the war, and how the truck was able to take damage pretty well which begs the question directed at Eugene, “How in the holy hell did you possibly kill this truck?” Rosita gives Glenn the picture of Maggie that must have dropped out of his pocket during the fight. Glenn says he’s sorry about their truck and walks away, Tara in tow. Rosita says they have nothing better to do so begins to follow them. 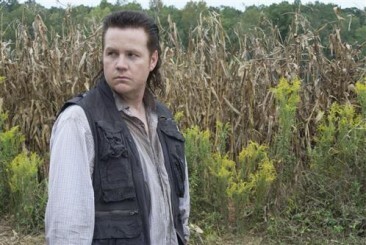 Eugene tells Abraham that they can always find another vehicle to get to Washington and heads after them as well. Left with no other choice, Abraham joins them. A man comes out of the house and sits on the front porch, eating a can of fruit. Rick spots Michonne and Carl returning from the supply run. He is about to shoot the man on the porch when a scream comes from inside the house and shots are fired. One of the men strangled upstairs must have reanimated. The man rushes inside the house, allowing Rick to reunite with Michonne and Carl. They quickly leave the area. Abraham appears to have gained some respect at Glenn’s persistence but still believes that saving the world is more important. Tara asks him why he is following Eugene and he says that he wants to save the world. She accuses him of lying. The Walking Dead episode, “Claimed”, ends with Michonne, Rick and Carl walking along a set of train tracks. They come across a sign on an abandoned train car saying that Sanctuary is ahead. Michonne asks Rick what he thinks. “Let’s go,” he answers. I am extremely curious about this Sanctuary. Will it be a safe haven as promised or a possible trap to lure people in? I love how every new group has a new nickname for the undead. Walkers, Biters and I noticed Abraham called one of them a “Dead Alive prick” in tonight’s episode. What do you think of Eugene? Could he have all the answers. Do you have a favorite character out of the new ones introduced? A absolutely love Sgt. 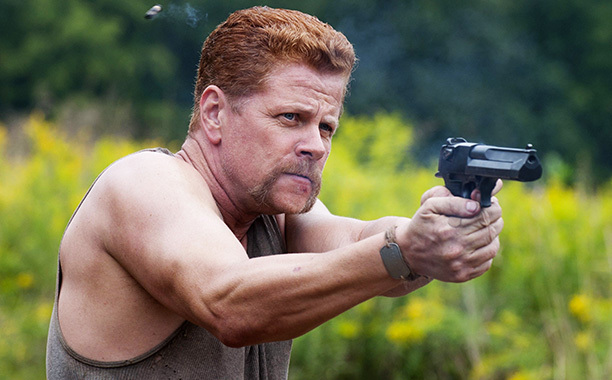 Abraham Ford! Overall, what are your thoughts about tonight’s episode? Come and discuss them in the forums!